I have vivid memories of watching Gallagher’s comedy specials when I was a kid. There was something visceral and satisfying in watching his routine, which invariably ended with the famous “Sledge-O-Matic” smashing everything from bottles of tartar sauce to the finale watermelon while the first ten rows hid squealing beneath their plastic ponchos. Naturally, when I saw the Panida Theater was hosting the famed comedian for his “Last Smash” tour, I was excited. I reached out to the man with the big hammer—who just turned 70 last month—and asked him about his life in comedy, his wacky run for governor of California and this last tour. The answers he emailed back are below. Let’s just say, at times, Gallagher’s answers come from left field, right field and sometimes from the parking lot. At other times, I had trouble matching up the answer with the question. Nonetheless, here’s the interview in its entirety. SPR: Do you often get the chance to connect with fans that grew up watching your comedy specials? Any fun experiences to share? 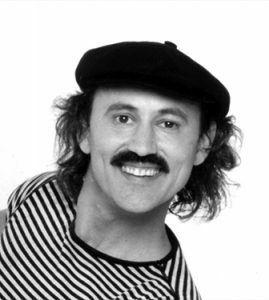 Gallagher: At one show with a female volunteer on stage who made fun of my baldness … then I had some remark … but she was ready to show it was a wig and she was a cancer patient. Some months ago she came by a small show I was doing at a comedy club in Port Hueneme, Calif. Since I described having a baby as a diaper on an anchor … parents introduce their kids to me as their anchors. The children mention seeing the giant couch routine taking things out of the crack. SPR: After more than three decades of performing, do you find that stand-up comedy has changed? If so, how? G: Novelty sells and then the pendulum of public interest swings away. Been there, done that … and that’s what’s occurred with the comedy club explosion. Home theaters and the internet are a strong competitor to going out. And now, what with the live speeches presidential candidates hold that seem more like comedy shows … it’s hard to get a crowd together to just laugh over drinks and not destroy long-standing national alliances and treaties. In the area of “what a comic can say” and “what’s over the PC line of good taste,” that changes with the news cycle. I feel like I’m operating in the decimated aftermath of Hurricane Trump as he stomps into the news … stirring up clouds of controversy … and forcing all the doors of propriety open … as he shows how he’s the champion of blowin’ hard … as he slams his way across the media landscape. SPR: I notice that you are playing a lot of smaller theaters and cities on this “Last Smash” tour. How come? G: I am working in the villages and the hamlets because that’s where the common sense of America is rooted. My comedy truthfully describes what I see, and I receive my best responses in the hinterland. A joke is basically the question, “Do you see what I see and ain’t it dumb?” The strength of the laugh tells everyone how much we all agree. Politicians learn “on the road” what will get the applause and laughs from an audience. The problem is after they’re elected they move on to helping everyone but the voters who put them in that position of graft. The Pope used to pay for that corruption connection. Just what we need—Bill Clinton back in the White House with nothin’ to do. Someone tell Trump he’d have more broad appeal if he’d quit callin’ ‘um broads? Obama said his White House would be the most “transparent,” and it has been to the international hackers. Obama got us out of the Middle East because he’s a golfer … and knows a sand-trap when he sees it. Riley Cooper has a new career with Nabisco … He’ll be representing all their crackers. You couldn’t get the Ten Commandments through Congress if Moses was buying drinks. Thou shalt not steal … would get the doctors irritated. Thou shalt not kill … would put you in the crosshairs of the Pentagon. Thou shalt not take the name of the Lord in vain … would be opposed by coaches, fans and players. Thou shalt not bear false witness … would be opposed by the Lawyers Bar Association. Thou shalt not commit adultery … would never get out of the Senate. You know those aging Senators don’t use bookmarks because they like their pages bent over. SPR: I read that you ran for governor of California during the tumultuous 2003 recall election and placed 16th out of 135. That election must’ve gone down in history as the weirdest gubernatorial election in history. What was it like for you? G: I not only ran against unspellable Swartzenneggar [sic], I came up with the idea of runnin’ to get publicity. I wanted to discuss singing the national anthem in Spanish and using helicopters to clear the freeways of clogs as they are the arteries of our economy. See my video on YouTube. I was on the ballot and voted for Arnie. Voting for who you know will lose is a waste of the power of your right to choose. SPR: Is this really your Last Smash? What will you do with your time once you’re finished touring? G: I have 24 projects on my bucket-list on my website Gallaghersmash.com. I have a patent for cool interactive fun software for playing slots on mobile devices. I have a poem (“The Duck”) that teaches kids how to eat more-balanced meals. Catch Gallagher’s “Last Smash” at the Panida Theater on Tuesday, Sept. 20 at 8 p.m. Tickets are $59 for the “Ultra Splash Zone,” $39 for the “Splash Zone,” and $29 for the “Safe Zone.” Gallagher will be bringing special guest Artie Fletcher. This performance is not rated, so bring young ones at your own discretion. Tickets are available on Panida.org or by calling 263-9191.